Now: Happy Christmas, Mark! Are you a big fan of Chrimbo? Mark: Yes! My brother Josh is still obsessed with it – we watch Home Alone 300 times and listen to Christmas songs. I’ll be on Heart FM again on Christmas Day and hopefully my family will be loving the tunes I play. Last year, Michelle celebrated in Essex with you. What’s the plan this time? We’ve moved into our new house in Essex now, so Michelle and I are hosting for the first time. My mum Carol and my Nanny Pat, my sisters Jess and Natalya, and my brother’s girlfriend [Hollie Kane] will help out too. It’s going to be the perfect Christmas in our first home together! Everything! There’s no dieting on Christmas Day. We have bacon sandwiches in the morning while we open our presents and then a massive Christmas dinner. Your Nanny Pat makes a cracking sausage plait, but what’s her speciality on Christmas Day? Her roast potatoes are great. What are you getting Michelle? I don’t know yet. She’s got everything she wants really. I’m more about what the present means. Michelle isn’t materialistic, so it’s not about how big the present is. If she said she wanted a designer handbag then maybe, but erm… we don’t go down the Chanel route! Is it true you’ve hired the Strictly band for your wedding? I’m speaking to them at the moment and we’re trying to confirm it. I can’t wait. Michelle‘s been something for me to work towards. It’s been intense – I’ve been working 18-hour days for the last three weeks and not sleeping much, but knowing I’ve got something to look forward to has helped me a lot. Christmas is coming and it’s going to be the best ever. 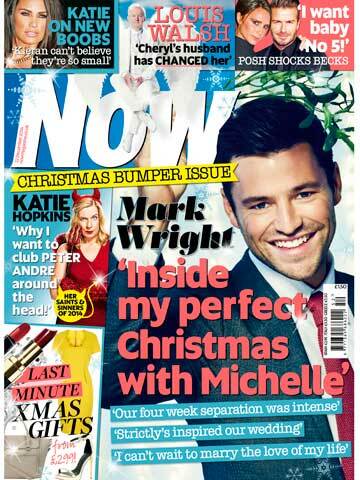 Read the full interview with Mark Wright, in this week’s Now magazine dated 22 December 2014 – download the digital edition now! READ MORE You’ll never guess who Mark Wright‘s booked for his big day!